I really love shrimp. And butter. It just says classic spring meal to me...made even more perfect when served out on the back patio! In a small saucepan, melt butter over medium heat. Add garlic and mix well. Let simmer for a few minutes to meld flavors. Next, pour garlic butter over shrimp. Make sure to evenly coat each piece. Then bake for 20 to 25 minutes at 350. Broil for an additional 5-10 minutes. Watch closely. Serve with a little cracked pepper, seasoning of choice and voila! We love shrimp garlic and we like to pair it with rice or noodles. So simple and easy to throw together and the taste is out of this world. 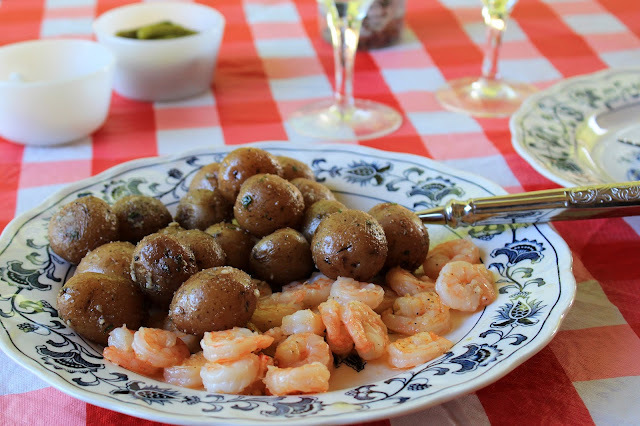 I love butter and shrimp too... add in garlic and it is def a hit around here! These look great..I was just eyeballing the frozen wild shrimp at Costco last week! Your opening line is so me! Give me all the shrimp and butter!